Jesse Ewell ditched his 12 years as a gym owner, 20 year personal training career in pursuit of a new lifestyle and new career calling. 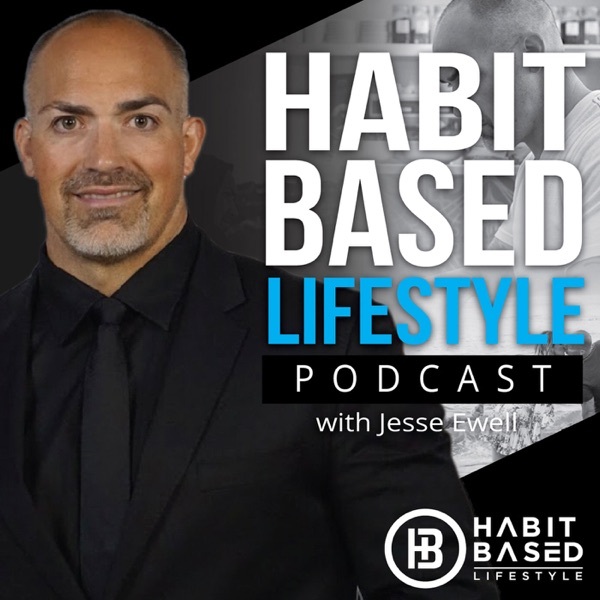 Habit Based Lifestyle was created off life experience from Jesse’s years as an athlete, businessman, trainer, husband and father. Jesse recently packed up himself and his family moved from Washington state to Orange county California to inspire people to love life on their own terms. Topics range from fitness, nutrition, spirituality, marriage, kids, relationships and business. The purpose of this show is to guide you to realign with habits that get you to live the life you’ve always dreamed of. Motivation is defined as "the reason or reasons one has for acting or behaving in a particular way.” After 20 years as a coach and a trainer, nothing has been blamed for failed results more than a lack of motivation. When we really nail it down, someone lacking motivation simply hasn’t defined a vision for what they want. When you have a plan, a purpose, and the habits to get there, you will never need external motivation. Listen as I provide a plan to eliminate motivation and get into a vehicle for change. Are you looking to connect with a group of like minded habit hacking people? Join my private facebook group along with 100's of others in my habit based lifestyle secrets page https://www.Facebook.Com/groups/307809586529906/ where I'll be dropping daily habits, tips and tricks every single week. Have you ever considered the unwritten expectations you have for your children and the impact they have? This is not only on your kids life but also your own. This became incredibly apparent this week when trying to get my son to go to bed. I got triggered because my wife and I hadn’t set out clear guidelines for him, and when he didn’t follow them I got upset. What kind of sense does that make? Today I take you through an exercise called the Parenting Re-Frame which will allow you to take a different approach to how you’re showing up in the moment. When things come up in our life and our thoughts begin to control us, it’s easy to get off track. The easiest way to keep yourself on the correct path is by living your life with intention. Intention pulls us through by tapping into our emotions and feelings and effectively rewiring our brain. Today I dive deep into how intention can transform your life by releasing you from the past and letting you move forward. What happens to you when you get knocked down? Do you give up? Do you sulk? Hopefully you get up and come back harder. The truth of the matter is that life hits every one of us with a lot of punches, some certainly worse than others. The pain of the punch is never what matters, it’s how we take it and react to it. We can choose to stay knocked down, or we can choose to pull ourselves back up. It’s cliche, but it’s true. Today I explore how resiliency has pushed me forward in my life and how you can use resiliency as leverage in your own life. Have you ever found that taking the “easy” way out is never actually so easy? Have you ever avoided doing what needs to be done and wound up carrying around completely unnecessary stress? It’s all a result of procrastination. Even though it seems easier, we create problems in our life because we put off important tasks. Listen today to find out how I created three months of stress in my life by putting off a simple task, what I did to fix the problem, and how you can avoid doing the same thing in your life. EP21 Do You Judge Yourself? EP20 Do You Have A Habit Of Not Smiling? EP16 Do You Have A Habit Of Breaking The Chain? EP15 Do You Have A Habit Of Skipping Your Workout? Your habits define your life. Small daily changes have the power to influence multiple aspects of your life. Getting in better shape will not only improve your overall health, but it will create more self confidence, allow you to show up better in your relationships, and make you more alert in your business. Today I provide a framework for identifying and establishing cascade habits to transform your life. EP10 How Much Time Are You Spending On Your Cell Phone? Awareness precedes change. Without becoming aware of a problematic habit, you don’t know why you need to get rid of it. Pretty simple right? Due to a recent update to iOS, I became painfully aware of my phone usage and screen time. After discovering a shocking number regarding my daily phone usage a change had to be made. Today I demonstrate how to eliminate bad habits through something I call subtraction by addition. If you’re a married business owner, life is challenging enough. When you bring kids into the mix, it’s like throwing gasoline on the fire. This is what I refer to as the Triangle Of Insanity. Unfortunately, once you enter this Triangle your relationship with your significant other is usually the first thing to go. What’s the solution? Tune in to see how I dug myself out of the Triangle and how you can do the same. E8 What Is Holding You Back? What is holding you back from achieving the success you want in life? In this Habit Based Lifestyle, there are four quadrants that drive us everyday. If we’re struggling, one of those four areas is acting as an anchor preventing us from reaching a new point on the journey. Today I explain the four quadrants, teach you how to pull your anchor out of the water, and provide the tools to accelerate you along your path. If you’re not honest and truthful on where you are and where you want to be, you end up building your goals in the gap of lies that sits between. We wind up stuck in a web of lies and sedation. When we’re truthful about where we’re at, we open up the possibility of leveraging our current position to reach our goals. Today I’m going to show you how to take advantage of this gap to reach new heights in 2019. How do you build for the future? First, you must know exactly where you are today. Once we’ve identified where we are, we must ask ourselves where we want to be one year from now? Inevitably there are stories and patterns you’ll have to let go of as well as new skills you’ll have to learn to get to where you want to be, but by focusing on where you want to end up it becomes much easier to identify what is standing in your way. E5 Are You Building Or Are You Burning? It’s impossible to get to where you want to go unless you know where you’re at. Getting clear with the facts creates a foundation of truth on which it is possible to build the life you dream of. The problem for many is they build their life on a foundation of lies, which only comes crashing down once exposed. Today we’re going to get real with ourselves and get headed in the right direction for the new year. To share questions or comments, feel free to reach out at Jesse@habitbasedlifestyle.com. Our environment can be our worst enemy. Habits form the simplest in environments where everything has a place and purpose. Look at your life and ask yourself this: do the environments you visit on a daily basis serve you? If not, a simple change can dramatically impact your life. Today we’re going to talk about how switching up your gym, grocery store, church, office, or any other place you frequently visit can change your habits and your life. E3 What Makes You Who You Are? When you spend your whole life defining yourself one way and that way disappears, what are you actually left with? If you’re like most people, you’re left questioning your identity. This is because your identity is too rigid. It’s so specific and so tied to one thing that it makes it hard to adapt when presented with life’s challenges. Realizing that you have the ability to be flexible in your identity will change your life. Let me ask you this, who do you believe yourself to be? With the holidays upon us, many of us have the tendency to relax. We stop taking care of ourselves, we overeat, and we lose focus. It’s time to get your mind centered on increasing production as we approach the new year. Today I bring to you a tool that has created massive impact in my life. It’s called the Habit Stack. Listen to find out how implementing the Habit Stack in my life allowed me to evolve into an entirely new person.